Do I live in the Barrington Public Library District? The Barrington Area Library District gratefully accepts monetary donations to fund our collections, programs, technology, and other initiatives. More details. Our 2018 Top Books of the Year for Kids and Teens! Weekly e-news sign-up form - the library sends out a weekly e-mail news blast with the latest information about our programs and services. It's a convenient way to stay up-to-date and find out about what's new and exciting. Kids' e-mail blast - Once a month, receive an e-mail full of workshops, story times, after school sessions, and live entertainment, just for children and families. Business e-blast - Receive a monthly e-mail with upcoming programs for small businesses, entrepreneurs, and job seekers. Quarterly Check It Out newsletter. Get the details and sign up to receive your quarterly copy by e-mail or mail. Try a sample of the online Check It Out by clicking the thumbnail in the window below, or, view a basic PDF version here (if you want to print your own copy, please use this PDF version): Quarterly Newsletter (PDF). The library will be closed in observance of New Year's Day, Easter Sunday, Memorial Day, Independence Day, Labor Day, Thanksgiving Day, Christmas Eve Day, Christmas Day, and New Year's Eve Day. The library is also closed once a year for a Staff In-Service Day. The date varies, but the event typically occurs in early December - check your newsletter. all in comfortable physical and virtual settings. 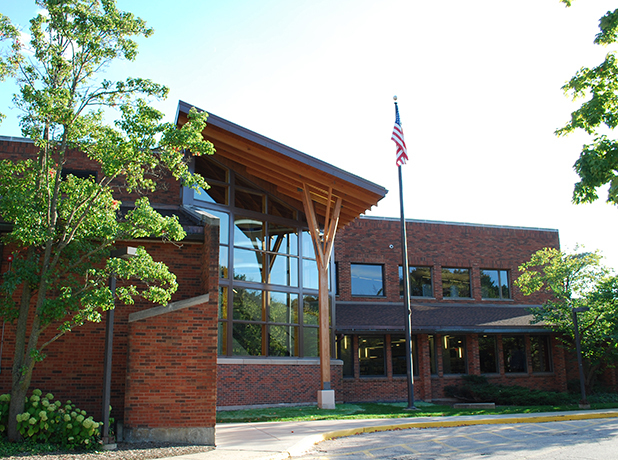 The Barrington Public Library District serves 44,157 residents of all or part of Algonquin, Barrington, Barrington Hills, Deer Park, Fox River Grove, Hoffman Estates, Kildeer, Lake Barrington, Lake Zurich, North Barrington, Palatine, Port Barrington, South Barrington, Tower Lakes, and some unincorporated areas. It covers a 72 square mile area, making it one of the largest library districts in Illinois, geographically speaking. While the military campaigns of World War I were being organized, an educational campaign was being launched in the small town of Barrington, Illinois. The campaign started when widow Caroline Ela passed away and left $1,000 in her will to help form a public library. A committee was formed to let the voters know about the benefits of a tax-supported public library. Unfortunately, the first referendum held on September 16, 1914 did not pass, but the Barrington Woman's Club decided to establish a library with donated books and a volunteer staff. Space was provided at Cameron's Drug Store and this library opened in early 1915. As the book collection grew, the library made several moves to larger quarters until 1924 when the Barrington Village Board offered space in Village Hall. During the next year, Barrington residents approved a library tax and a tax-supported library became a reality. The Barrington Woman's Club turned over the library to the village and the first library board was elected in 1926. The library remained in Village Hall until 1957 when a new library was constructed at Monument and Hough Streets. In this colonial-style building designed by architect Ralph Stoetzel, the first full-time librarian was hired in 1963. In the coming years, interest grew in forming a library district, which could serve additional communities. In 1969 and 1970, referenda were passed which made the village library a district library serving portions of four counties in an area of 72 square miles. With the expansion of the area and population served, the Library Board began negotiating for a new library site. The Jewel and Kendall Companies in Barrington donated seven acres of land on Northwest Highway for a library in 1972. A bond issue was approved for a new library building at this site in 1975. Designed by the architectural firm of Coder Taylor Associates, the library opened its doors in 1978. In 1989, the architectural firm of Ross Barney & Jankowski was hired to design an addition to the library. By 1993, the building was expanded to its current 60,000 square foot size. In 2013-2014, the library underwent a complete redesign and renovation, working with the firm of Engberg Anderson. The building was not expanded, but redesigned to make the most efficient use of the space for the public. Improvements and additions include: a completely redesigned Youth Services department with a focus on active play and learning; a Business and Technology Center, featuring a MakerLab, digital creation studio, computer lab, study rooms, media:scape collaboration spaces, 10 person Conference Room, and Business Cubicles; improved and refurnished Meeting Rooms and Zimmerman "Smart" Room; redesigned Customer Service area and Internet Cafe.